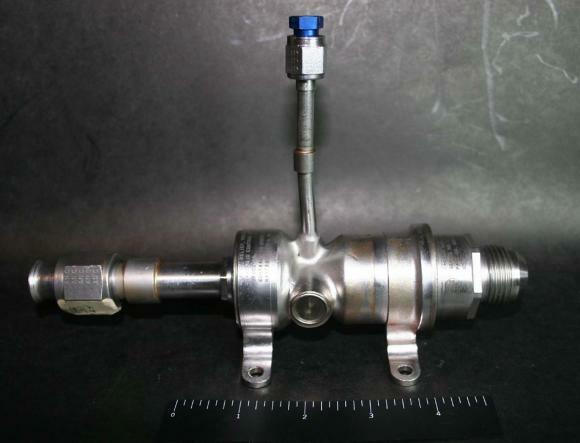 Helium Pressure Relief Valve manufactured by CALMEC Manufacturing Corp for the Apollo Service Propulsion System (SPS) pressurization subsystem under subcontract to NAA (NASA contract NAS9-150). The pressure relief valve (one of two which would have been integrated into the SPS) consists of a relief valve, a diaphragm, and a filter. In the event that excessive helium or propellant vapor ruptured the diaphragm, the relief valve opened and vented the system. The relief valve would close and reseal after the excessive pressure had returned to the operating level. The diaphragm provided a more positive seal of helium than a relief valve. The filter prevents any fragments from the diaphragm from entering onto the relief valve seat. The relief valve opens at a pressure of 212 psi after the diaphragm ruptures at about 213 psi. The valve will close when pressure drops to 208 psi. Regulated helium was utilized by the SPS to provide positive pressure to the fuel and oxidizer storage tanks and drive the propellant fluids into the Apollo Command Service Module's main engine.